INDIANAPOLIS — Speed tables that were meant to slow down drivers who are bypassing Red Line Construction are now causing headaches for drivers in the winter weather. Snow plows are also causing major damage to those speed tables, leaving sharp edges and dangerous conditions that drivers have to avoid. The speed bumps were installed late last summer along Central Avenue between 38th Street and Kessler Boulevard. They're meant to slow down traffic on Central Avenue while the road serves as a detour for Red Line construction. This isn't the first issue drivers have had with the speed tables. They caused controversy back when they were first installed because the city chose not to cover all of the lanes on Central Avenue, which allowed drivers to go around them and created other dangerous conditions. The city eventually fixed that issue. Now, the snowy winter and damage from plow trucks are making those speed tables dangerous in other ways. RTV6's Paris Lewbel took your concerns to the city who says they are aware of hte issue and they are working on repairs. 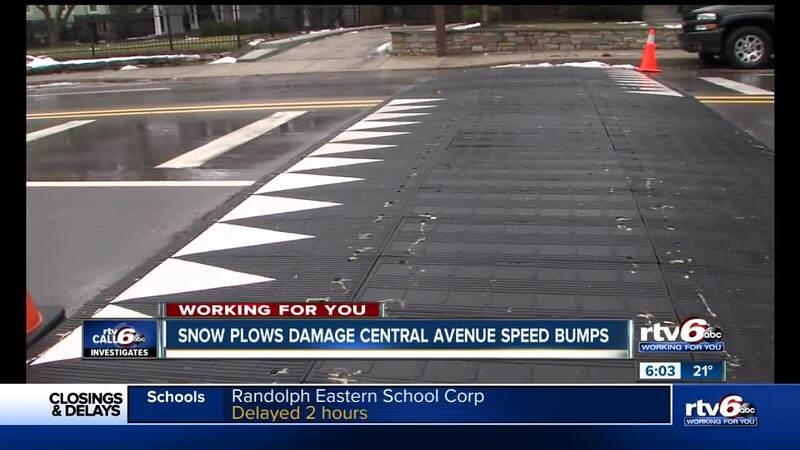 "DPW is aware that snow trucks can damage these temporary speed tables and the traffic maintenance team has begun repairing them."